Bromsgrove may seem like quite a small town compared to areas around it, but, in the centre of it all, Bromsgrove High Street offers a wide variety of shops and cafes, all for you to explore. From household names such as Pizza Express, who serve delicious pizza and pasta to any hungry shopper, to quirky vintage shops that offer fashion and jewellery in all the returning trends, there's a shop for everyone and anyone. But hidden away between rows of retail is a book lover's paradise that sometimes gets overlooked. Despite not having the breadth of Birmingham or the luxuries of London, Bromsgrove has a lot of shops. So, while on your travels, why not pop into one of Bromsgrove's bookstores and pick up the latest releases? Open 6 days a week, WHSmith is the perfect store for anyone in search of stationary or browsing for books. Located near Poundland, WHSmith offers a brilliant range of novels, newspapers and magazines that I know many of Bromsgrove's citizen's benefit from. From the latest Stephen King thriller, to the next Miranda Hart biography, you'll find all the best books in Bromsgrove, all in one shop. Boasting a display of the Top 100 books, kept up to date by hardworking staff, you'll always be the first to grab the newest novel. But if it's something cheaper you're after, books can be found in any of the charity shops dotted up and down the high street. Oxfam Books and Music is the perfect example, offering a massive selection of cheaper, second hand books and CD's. Situated next to The Card Factory, the money from sales goes to the charity itself, and all the stock is donated by the people of Bromsgrove and Redditch. And with the money you use to buy that book you'd been searching for, a child in Africa can learn from a proper text book – a win/win situation for everyone! But if you want a break from the bustle of the high street, just up the road is the local library that offers you books from an even greater range of genres – all for free! All you have to do is sign up (also for free) and take out the ones you want. With sections for adults, teens and children there's always a book for you, with coffee and tea facilities and a convenient car park especially for its users. 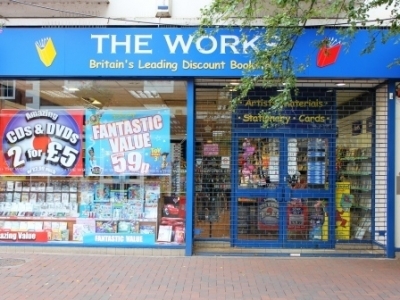 If you're after stationary as well, The Works is the shop for you: with brilliant box sets for discounted prices, and non-fiction subjects ranging from knitting to cooking to gardening. Bookworms will have everything they need. And, as an added bonus, stationary, toys and all an artist can think of are also available to you – for prices that won't break the bank. So, if you're ever in Bromsgrove and in need of a good book, you'll know exactly where to go. Bromsgrove may be small, but one trip down the High Street (despite the odd empty shop here and there) will show you there's a lot more here than meets the eye.